You will begin your eight-day journey of discovery in Namibia and finish at the Victoria Falls in Zimbabwe. Equally magnificent, each region offers a unique experience of overwhelming beauty. If you love adventures, Africa is close to the top of millions of bucket lists. In this safari, you will experience the best of Africa! You will stay in various accommodations which will include two nights in a hotel and five nights in a non-participation camping. You will only camp in places where the location, scenery, and setting will ensure you get up-close and personal with nature. This tour delivers an unforgettable experience as you dance with the San (Bushmen), do a Mokoro excursion in the Okavango Delta, and soak up the incredible views of Victoria Falls. From the majestic landscape of the Okavango Delta to the breathtaking water views of Victoria Falls, you will experience many sides of Southern Africa. Explore Windhoek during the day and meet your group and your tour leader in the evening at 18:00 to get acquainted and review your trip details. Windhoek is a tiny capital town but with loads of interesting things to offer. One of the most famous is the display of 33 meteorites, the Gibeon Meteorites in the Post Street Mall. There you can take pictures of and touch these extra-terrestrial bodies that are corrosive resistant due to the high amount of nickel in them. Shopping opportunities abound and for the historically inclined, there are many museums and historical buildings within walking distance around the town center. One of the most widely photographed and a historical landmark is the Christ Church, a Lutheran church, built in the Gothic revival style. Depart Windhoek early for a long drive through the eastern part of Namibia, crossing the border into Botswana and traveling into the heart of the Kalahari Desert. Ghanzi is the farm where the San (Bushmen) live. They still have the knowledge of an ancient lifestyle and are eager to welcome visitors into their almost forgotten world. In the evening, enjoy an optional ancient dance ritual performed around a campfire by the San and if the night is clear, enjoy the sparkling, starry skies for which Ghanzi is famous. Enjoy a morning walk with the San (Bushmen) as they display their survival skills that have been passed on from generation to generation before departing Ghanzi and arriving in Maun, Botswana’s fifth largest town, after lunchtime. Once you arrive in Maun, you will have the option to get a spectacular birds-eye view of the Okavango Delta from above in a small fixed wing aircraft (weather permitting). Looking down on the Delta from the aircraft, you will get a fair idea of the magnitude of this massive mix of land and water with its intricate system of channels and islands. You might also see families of elephant, giraffe, and herds of buffalo or even hippos from the air. If you skip the flight, you will have the chance to kick back and relax at the lodge. Today you experience a new way of traveling into the Okavango Delta with a mokoro, the same way as the local people do. A mokoro is a traditional dug-out canoe that seats two people. Your engine is a human being called a poler. The first part of the journey is in a four by four vehicle to the “polling station” where the mokoros and polers are waiting. Once you are comfortable and laid back in your mokoro, the slow and tranquil journey into the delta begins. Gliding along on the quiet water you will have an unlimited source of opportunities to take stunning pictures of your surroundings. How long the mokoro journey will take will depend on the time of year and water levels of the delta. You will stop for lunch on an island and enjoy a nature walk of a few hours. Then you head back to Maun again in your mokoro enjoying the last hour or two on the water while the late afternoon sun starts heading for the horizon. Set out for Elephant Sands, which is close to the Botswanan village of Nata. Elephant Sands is famous for its watering hole, voted as one of the top ten watering holes in Africa. There you can expect to see animals such as wild dogs, different antelope species and of course elephants that walk through the campsite searching for fresh water. Continue to the small town of Kasane, which is adjacent to the Chobe National Park and Chobe River. Relish the views during your included afternoon sunset boat cruise. Take your own sundowner with you as you look for wildlife on the banks of the Chobe River. Game such as elephant, buffalo, kudu, bushbuck, hippo, giraffe, and sable are commonly seen along the river edge, and it is a birdwatcher’s paradise during the summer months. (You have an opportunity to go on an optional photo safari at your own expense, however, you would forfeit the included afternoon sunset boat cruise). Today you will have time to do some of the action-filled activities that the area offers. Bungee jump or gorge swing off the Victoria Falls Bridge that links Zambia and Zimbabwe and have a different view of the Victoria Falls at the same time. This bridge is constructed to carry railway, road, and foot traffic. For an adrenaline activity, closer to the Zambezi River, choose a half day or full day whitewater rafting adventure. 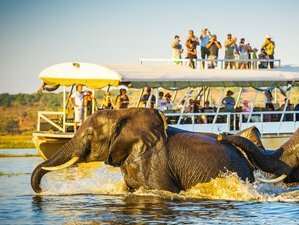 Many of the groups opt to book their final evening together aboard a sunset cruise along the Zambezi River with game viewing, beautiful scenery, and an open bar. This safari and tour will take place in Namibia, Botswana, and Zimbabwe, which will cover a distance of around 1,600 kilometers. You will explore Okavango Delta, Maun, Ghanzi, Elephant Sands, Chobe National Park, Chobe River, and Victoria Falls. On one hand, you have a natural wonder of the world, Victoria Falls, which is a magical realm of mist-soaked rainforest shrouded by the deafening roar of cascading water. On the other hand, you have Botswana, which is home to 70 percent of the Kalahari Desert and the Okavango Delta, one of the largest inland deltas in the world. During this safari tour, you will be provided with seven breakfasts, five lunches, and five dinners. Most breakfasts and dinners will be prepared by your adventure crew but you will also be provided with an opportunity for eating at local restaurants. Please book your flight to arrive at Hosea Kutako International Airport (WDH). Transfer from this airport is included. Walk out of the international arrivals area and look for a transfer person holding an Africa4us sign and your name. Airport: Hosea Kutako International Airport Airport transfer included: Hosea Kutako International Airport No additional charges. You can request this in the next step.